Everybody should place this project on their bucket list. The car will break down 80% 2 160 While there are plenty of service shops and Jack-of-All-Trades dispersed around Russia, the itinerary includes desolated areas. A car mechanic will take part in the journey. An expedition member getting ill 90% 1 90 Medicines and pain killers will be taken. Your car being stolen 10% 5 50 This is worse than a crash as you’re gonna lose both car and travel gear. The itinerary must exclude cities and leaving the car unattended along highways. Border crossing and police-related troubles 50% 1 50 Inform yourself up-front. Read accounts of expeditions to Russia. Have spare cash. Fatal car crash 10% 4 40 Research chances of car rental around Russia and how costly a surcharge for returning the car to a different location is. Obtain a credit card. Consider insurance. You’ll meet your future better half en route 5% 1 5 Just keep a bottle of premium Cologne in the trunk. With 160 priority ratio your car immobile and stranded without a spare in the middle of nowhere is obviously the greatest risk to the project. Note the single opportunity registered in the table above. Appealing theme is half the battle. The competition simultaneously launching their campaigns 70% 2 140 Allow 50% of “regular budget” for extra bidding. Optimize you copy during the campaign to maintain quality score above competition’s levels. Broken links. People click and get 404 errors 30% 4 120 Simple solutions to this risk exist. (1) Cross-check – another person clicking through all the links, and (2) involve a detail-oriented person into the project. Include a phone number on banners. Banners are a flop. For unknown reason people don’t click them 30% 3 90 Surprisingly likely is this negative reception of your graphics or the headline. Prepare two or three distinct projects. And brace yourself for replacing them if they all fail. You’re running into legal issues 3% 4 12 Fine print not properly written + a pesky client and you may end up in court. Do be brave and have an attorney at hand. With 140 priority ratio the competitors’ marketing activities are the greatest risk to this project. A lawsuit from a customer ranks amazingly low. Therefore use common sens. Take your time. Your team is not likely to do the profound risk assessment during a single day or a week. Now what makes a great tool for the project risk assessment? For personal projects MS Excel might be enough. Note that both the colors of risks’ border-left ribbons and the arrows in the boxes stand for the same – the priority of a given risk. While the border-lefts have been automatically calculated by BigGantt, the red, orange and green arrows have been assigned arbitrarily by a user. Luckily the bottom right corner of the matrix is empty, so we’ve got no critical risks in the project. 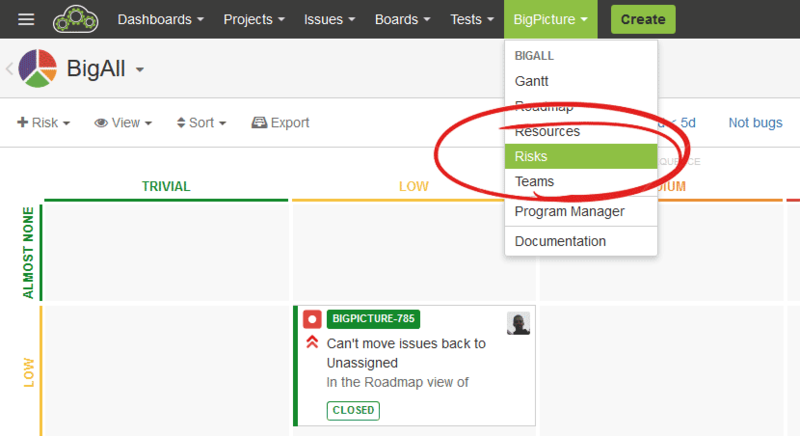 You can use the Risks module in BigPicture for more sophisticated risk management. For the example no. 1 (“Travel to Baikal Lake”), let’s carry out a hazard analysis. Hazard analysis is one of the first steps in change or safety management, or risk management in general. So, how to manage risks in BigPicture? How to launch the Risks module in BigPicture. Identify the hazards/risks – using various techniques such as brainstorming. 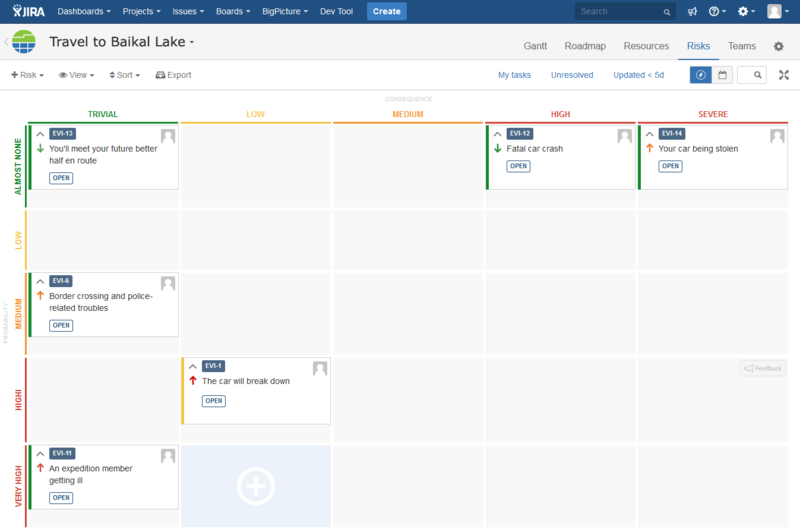 Create “hazard” issue types in Jira and link them to your project tasks. Note: identified hazards will not be visible on your Risks matrix yet, as you would need to assess the probability of the causes and effects later on. Identify and assess the severity – once you identify the possible effects and their likelihood, you can now select the worst credible scenario and visualize your hazard/risks on the risk matrix. To display hazards on the risk matrix you would need two custom fields – risk probability and risk consequence – and values for those select type of fields – see picture 1 below. Now, enable the “Heat mode” to check if the related level of risk is acceptable – this will be indicated by the color of the hazard card on the matrix. The matrix clearly shows which risks are too high – if you are a risk taker then you might proceed. But to avoid car troubles, let figure something out. Tip: Use quick filters to limit the scope of data presented. It is a good moment to create risk baselines (the grayed out bars on picture 2 below – COMING SOON). Tip: In heat mode, colors of the cards will reflect the level of risk (eg. red – high risk > mitigation required). Identify the causes – once you have identified which hazards/risks require mitigation, it is time to identify and mitigate their causes to lower the risk level. How can we avoid car troubles? – let’s take a mechanic onboard. He can inspect the car before the trip to reduce the probability of breakdown or simply fix the car when it breaks. TIP – there are different types of links. You can link your mitigation means using Jira dependencies in order to trace your actions – links will be visible on your task cards (chain or “bind” icons) and on the risks registry (COMING SOON). TIP: Make sure to review them to check if they are effective. Reassess your hazards/risks probability and consequence using the matrix taking into account the proposed mitigation means (or barriers). When the risk level is acceptable and your cards are green (picture 3 below), assign the proposed mitigation means to responsible users – risk owners. Monitor the risk. The last task is to monitor if the mitigation means are effective and prevent hazards/risks from occurring. Use the “Heat-mode” and dependencies to demonstrate traceability – now, when all your risks are managed, you are good to go! Enjoy your journey and remember to update your risk registry! Picture 1: Visualize your hazard/risks on the risk matrix. Let’s assume that the probabilities of “Fatal car crash” and “You will meet your future better half and route” are higher than in the table 1 above. Picture 2: Three risks have been mitigated. They moved from baselines (grayed out bars) to their new positions with lower probabilities. Picture 3: In heatmap mode all risks but one are now green.